The first Clubmaster style sunglasses that are a new level of quality, durability, perfect balance and worry-free - combined with the perfect fit allowing you to live your amazing life.The Empires are a vintage & timeless look re-engineered using state of the art materials. With our lifetime guarantee, you never have to worry about taking them along for the adventure. 100% LIFETIME MONEY-BACK GUARANTEE: If for any reason you feel our sunglasses are not the best you have ever experienced, then we will give you your money back. And if our shades are ever stolen or lost, contact us and get a discount to replace them. CLASSIC CLUBMASTER STYLE MADE WITH AEROSPACE GRADE TITANIUM: You already know that Clubmasters look good on you. But realize that these are the highest quality, longest lasting, most durable pair of Clubmasters ever made, which got us featured in Maxim, US Weekly and more. Titanium is the strongest metal for its weight, which allows you to use your sunglasses actively without worrying about them breaking. WORLD'S LIGHTEST NYLON POLARIZED LENSES - SCRATCH RESISTANT AND 100% UVA/UVB RAY PROTECTION: At less than half the weight of traditional glass lenses, you can reduce eyestrain, ban your eyes from blinding glare, which makes driving safer, and days at the beach more relaxing. The Empire is extremely strong, but also deceptively light. Titanium is also hypoallergenic, meaning it is perfectly safe for the human body. Doctors use the element for hip and knee replacements for this reason. Disclaimer: These are authentic William Painter sunglasses, designed by a small independent team in California. 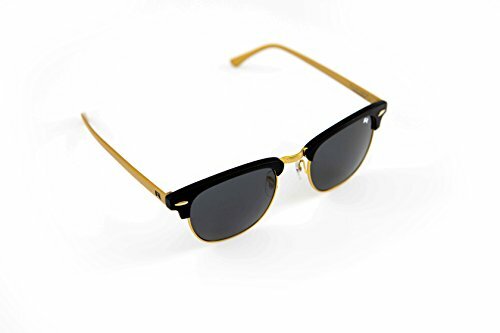 These are not Ray-Bans, Oakley, Maui Jim, Arnette or any other Luxottica brand. 100% lifetime Money back guarantee plus free returns. Classic Clubmaster style made with aerospace grade titanium. World's lightest nylon polarized lenses with scratch resistant and 100% UVA / UVB ray protection. Strong aerospace grade titanium quality with a revolutionary fit. Incredible value for lifelong durability, backed by a guarantee. Note that the guarantee policy only applies to products sold by William Painter and not any other reseller.